Press Release (ePRNews.com) - BURNSVILLE, Minn. - Dec 11, 2017 - ​​Silver has never looked so refreshing. GovMint.com and ModernCoinMart, in cooperation with S&A Partners – The Official Coca-Cola Licensee for Collectible Coins – has teamed up with Coca-Cola® to bring collectors something they’ve never seen: legal-tender silver dollars that look like Coca-Cola bottle caps. Struck in six grams of 99.9% pure silver, the coins are officially licensed by Coca-Cola and are legal-tender dollars making them both a meaningful and long-lasting collectible item. Since 1892, Coca-Cola has been encouraging the world to open happiness by enjoying an ice-cold Coca-Cola beverage with friends and family. Their relatable branding and timeless appeal has made Coca-Cola an internationally recognized icon – all of these ideals are wonderfully showcased on these bottle cap-shaped $1 silver coins. At first glance, the coins look like large Coca-Cola bottle caps: the white logo shining on a field of red. But flip them over, and collectors will find the coin’s weight, purity, 2018 date and $1 Fiji legal-tender value. State-of-the-art minting technology and colorization techniques were used to replicate the shape and appearance of Coca-Cola bottle caps. Each raw coin comes in a collectible Coca-Cola branded tin adding to the appeal of each silver release. Coca-Cola is the #1-selling sparkling beverage in the world, and has been enjoyed for more than 130 years. With this being a brand-new way for collectors to admire the beloved Coca-Cola brand, demand for this release is sure to be high. 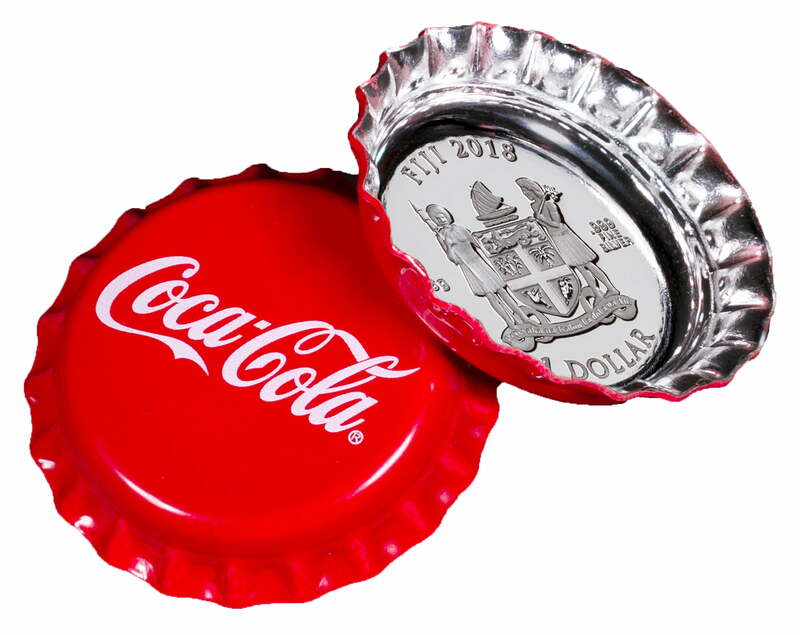 Available for a limited time at https://www.govmint.com/2018-fiji-1-dollar-silver-coca-cola-bottlecap-proof and http://www.moderncoinmart.com/cocacola. Since 1984, GovMint.com has been one of the world’s leading sources of collectible coins. Headquartered in Minneapolis, MN, GovMint.com is an official distributor for seven major world Mints and offers collectible coins from over 120 countries. ModernCoinMart sets the standards for online sales of bullion, U.S. coins and world coins with free shipping, competitive pricing, a large selection, and incredible customer service. Confidence. Trust. Reliability. That’s the MCM way. More information at www.ModernCoinMart.com or call 1-800-362.-9004.